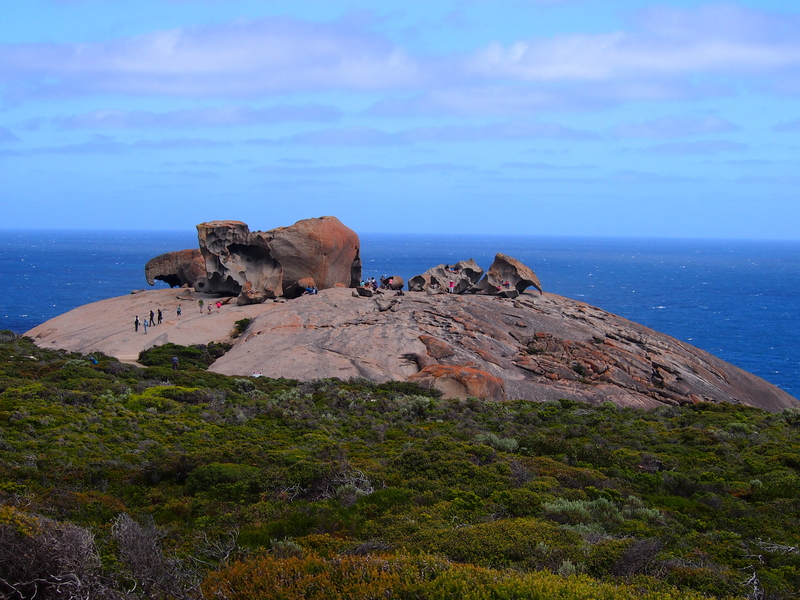 Travel is bliss: A visit to South Australia’s granite boulders, the Remarkable Rocks, on Kangaroo Island. Thinking about what constitutes bliss for me – one experience I relish is the opportunity to travel. I have a need for new experiences and intellectual stimulation and discovering new travel destinations helps meet that need. What is it I find so blissful in travel? Apart from discovering places that are new to me, although I do love culture and the hustle of cities, I also revel in getting away to places where the sky is wide and the night stars are not dimmed by manmade light. I also love the feel of a warm (not too scorching) sun on my skin, and the opportunity to go barefoot, or expose my feet to the elements. Sometimes I long to escape shoes. I read something once about someone’s theory that grounding or earthing yourself somehow by touching your bare feet to the earth could help ease jet lag. I have no idea about the foundations of this theory or its effect in practice, but I certainly find something elemental about walking barefoot on uneven ground or sand (preferably free from ants and snakes etc.). In other possibly pop psychology, I’ve also read that just seeing green has a positive psychological effect on our brains and I know something in me opens up when I’m away from the concrete constructions of suburbia and instead surrounded by plants and soil. I love discovering unfamiliar species and seeing if I can spot various plants in flower. The times that I’ve been alone, or with quiet people on a path and we’ve had the opportunity to spot a bird or animal that would have otherwise gone unnoticed are times I cherish. On a visit to Kakadu, due to a series of circumstances, only a few of us in a group got to see Leichardt’s grasshopper, a bright orange creature who I’m told can only be found in one type of terrain, on one particular plant. There’s a great thrill in seeing something that is rarely seen, and seeing it not in a zoo but in it’s own habitat. Another aspect of travel I appreciate is the random conversations and interactions that can occur. You can meet people in all sorts of situations: for example, as fellow sufferers of seasickness on a seal-watching trip in the Southern Ocean and then end up visiting a steak house together (even though you’re a vegetarian) and going to an abandoned lot to hear a rock band who do Mongolian throat singing as part of their act. It’s these interactions where your path crosses that of another that you remember, and value, even if you never meet the person again. In a place where you don’t know anyone else, and maybe where you don’t even speak the language, organic connections are made and memories of discovery shared. The bliss of travel. I Walk the Line: five positive life principles I’ve adopted and embraced. I read somewhere that psychologically just seeing greenery (grass, shrubs, trees etc.) lifts our moods and does us good emotionally as human beings. As someone who struggles with living in the ‘burbs and with the way we concrete over everything in cities, I try to keep reminding myself to get out into the green and just look at the plants, or sit on the grass. I hate routines, although I know they often do me good. I classify myself as a ‘project-oriented person’, rather than a ‘maintenance-oriented person’. I like novelty, and new projects and crises and stagnate with routines and the maintaining of daily repetitive tasks. In struggling to maintain household and personal routines, one way for me is to try to keep things creative. I bought some (purple, because it’s my favourite colour) dice and allocated each number a cleaning task. My aim was to throw the dice each day and go with the cleaning task the dice landed on. This worked for me for a little while anyway, as a person who loves variety I’ll just have to keep coming up with creative ways to maintain my house. This one is a physical and metaphorical challenge. I find if I’m in a bit of downcast mood, I tend to keep more curtains closed in my house and so this mantra is a reminder to let physical light into my house. On another level, ‘let in the sun’ reminds me to remember the things that give me emotional energy and life, and to make time for those things, even in the midst of busyness. For me some of those things are pursuing creative endeavours (art, craft, music), catching up with long-term friends who are easy to be with, listening to live music and walking in natural surroundings (in the bush, on the beach). In my busy times, I try to learn from my cat. He can sit for hours on end, seemingly staring at nothing (or everything). He’s pretty content as long as he has food and ready access to someone to sit on, or a bed to cover with his shedding fur. He is a pretty minimal meow-er, only reserving it to ask for essential needs. He is content with little, and easily shows his contentment with a happy rumbling purr. A few years ago I got into blogs and books on minimalism and de-cluttering. Having grown up in a hoarding-tendancy household, it’s taken a while for me to appreciate that freedom and a sense of home can be found in not being surrounded by hundreds of possessions. I used to find comfort in sleeping surrounded by bookshelves, wardrobes and craft materials. I have hobbies that tend to involve a lot of ‘stuff’. But I’ve been learning to appreciate physical (and resulting mental) space in the rooms in my house, since doing some de-cluttering. I also appreciate being able to let go of items I don’t use, and find them a new home and use with friends, people in need or in op shops.